A life long wood hobbyist from his seventh - grade shop class. Jim enjoys anything that makes saw dust. 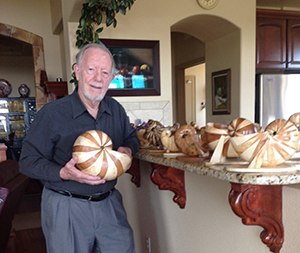 His first project was a spice shelf for Mom at age 13 and goes on from there to his latest creations, “Colorado Sea Shells” at near 80 years of age. In between Jim has created natural hand finished furniture from dining tables to grandfather clocks and roll-top desks, etc., etc. Not timid to do his own work he accepts commissions for custom pieces based on a client’s needs and wants within the constraints of his shop. 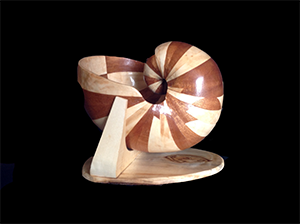 Jim has joined Arati to let a wider public become acquainted with “Colorado Sea Shells,” segmented scroll-saw carvings. Using various wood combinations and adaptions, creating unique shapes and colors, the shells are a wonder, and instant attention getters. 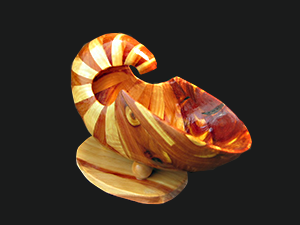 Besides shells, Jim is offering other wood decorations including band-saw boxes, Shaker “Tupperware”, jewelry containers, and what ever comes in his dreaming. 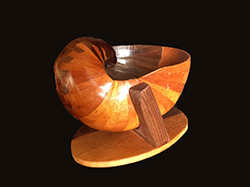 Click here to view more of Jim Brown's pieces.